In terms of oil production, Mexico is still a country with a high dependency on foreign investment, advice and technology. Since 1938, when Lázaro Cárdenas nationalized the oil companies in the country, we have experienced very short technological and efficiency outcomes. As part of the major reforms that the “new” Mexican government wants to implement to improve the national economy, the Energy reform is the one that drives my attention the most. I noticed that regardless of the fact that foreign investment might be needed to make the oil national company (PEMEX) more efficient, it hasn’t at all touched the Oil Union. For years, unions in Mexico started as a way to protect the workers from abusive practices from their bosses and the entrance of the free market. Throughout the years, the unions did improve the workers’ conditions and stood up against low wages, bad working conditions and lack of labour benefits. “You give your resources away, well, screw you!” Lazaro Cardenas, seconds after he nationalized the oil companies in Mexico. I come from a “Pemex” family, which means that most of my relatives have worked for the State Company. My education was mostly paid with Pemex money, and I always had the doors opened if I wanted to join the union. Since I was a wee boy I realized that Pemex wasn’t doing its job properly, and that the union became the heaviest burden for the efficiency and productivity of one of the major oil companies in the world. Pemex needs hard-core investment in its infrastructure and technology, better training for its technicians and a global business vision. However, this Energy Reform fails to touch the union, which is, in my opinion, the biggest cancer that the Mexican oil industry faces at the moment. Until the government makes it clear that the union must obey clear rules in order to make its members better workers, professionals and technician, until then, Pemex will relay only on subsidies and shallow foreign investment. So far, Peña’s administration has show weakness on establishing a clear path in order to foster a strong and reliant Mexican economy. His administration has neither satisfied the international market nor the opposition parties, some more nationalists than others, with their initial proposal. Maybe they should spend more time on straight forward strong initiatives and less money on telly spots where a high class Mexican explains to the low class population (around 70% of the Mexicans) why this reform will benefit all of us. Ps. Oh, check the news about Mexico, after 8 months, there’s no much positive things to say about this administration. Just saying. Ok, let´s do this, the following is a very simple, however, impressive recipe you must learn. Remember how I told you that I learnt to use the oven while I was in New Zealand? Well, this recipe follows the same principle: trust your oven, buttered your trays, and don´t be shy to cut through whatever you are grilling. 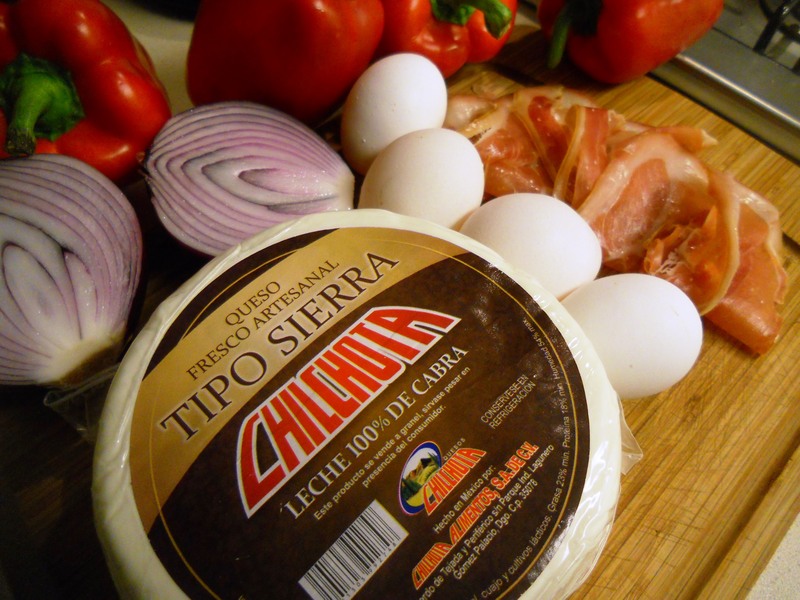 250 grs of goat cheese (diced or crumbled) – Chilchota Brand. Let´s be clear with this recipe, you must read this instructions and look at the pictures. 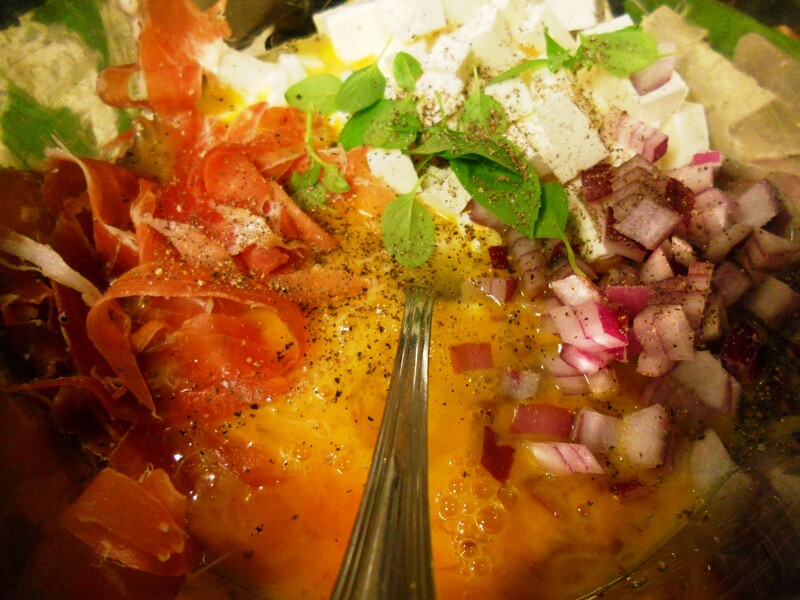 First, in a bowl mix the eggs, goat cheese, red onion, basil leaves, Spanish ham, salt and pepper. Whisk the ingredients and put aside. Right after that, grab the capsicums and carve a wee window on one side, make sure that when you do this the capsicum can stay on the surface totally balanced. You´d be making a capsicum chest, so to speak, take the seeds out carefully, now let´s go with the fun part. Fill every capsicum with the ingredients previously mixed, now put them in a tray and cover them with tin-foil. Place them in the oven and let cook them for 50 minutes (or until the inside of the peppers looks cook, pretty much like a quiche) at 160C°. 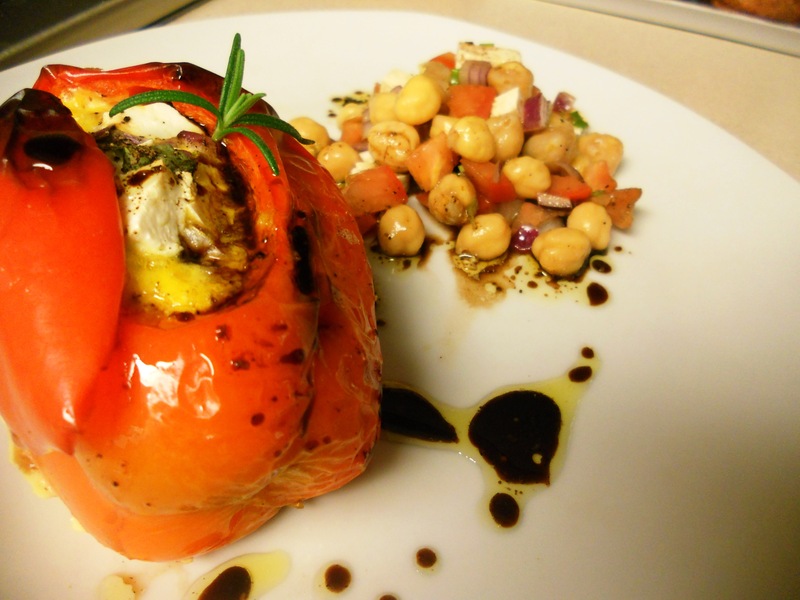 Plate the peppers with some chickpeas, tomatoes and more crumbled goat cheese salad. Et Voila! Impressive, isn´t it? Ps. I forgot to tell you, we are also using free range eggs from Valle Organico; mate, honestly, is there another way? Ps2. If you like this recipe, let me know what else would you like me to cook, don´t be shy, I don´t mind.